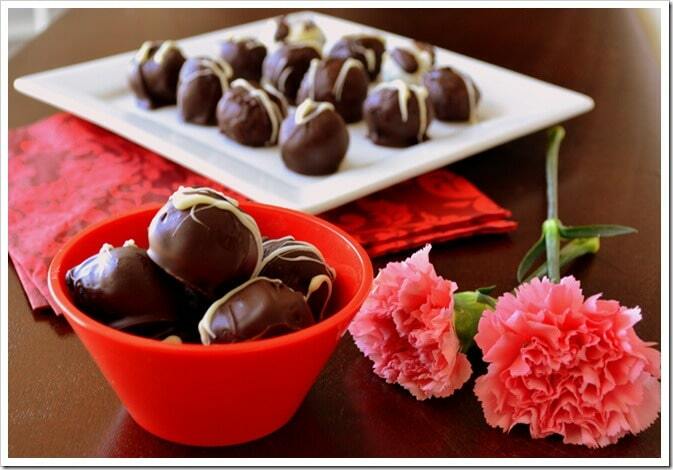 Who wants the recipe for homemade Chocolate Truffles? ME! ME! I can probably eat chocolate every single day for every meal so when my partner in crime and my soon-to-be 7 year old insisted on doing something special this weekend making Chocolate Truffles seemed like a perfect idea! Someone had brought these AMAZING Chocolate Truffles to a potluck party and I couldn’t believe her when she said it was really easy to make. I took the recipe but I lost it ..fortunately I remembered the key ingredient – Oreo cookies! I looked up the recipe and found one in the Kraft website and we got started. The best part was it needs only 3 ingredients plus it was super easy to make and it makes 40 pieces – enough to share with your friends,family,neighbors and colleagues! It is a great recipe for you and your kid to make together. Note: To get the drizzle that you see on the Truffles I used a pastry gun from the Kuhn Rikon Pastry Decorating Set and drizzled from one end of the sheet where the truffles were placed to the other..quicker..faster cooler way to get a beautiful drizzle on the truffles. Took me a while to figure that out, I was doing one Truffle at a time..ugh! Microwave cream cheese in a microwave safe bowl for every 10 seconds until it softens and there are no lumps. It took me 25 seconds. Or you can soften it by keeping it in room temperature for 2 hours. Roll into balls (the size you prefer). Place it in the freezer for 15 minutes. Meanwhile, melt the chocolate by placing it in a microwaveable bowl in a microwave for 2 to 21/2 minutes. Stir every 30 seconds. 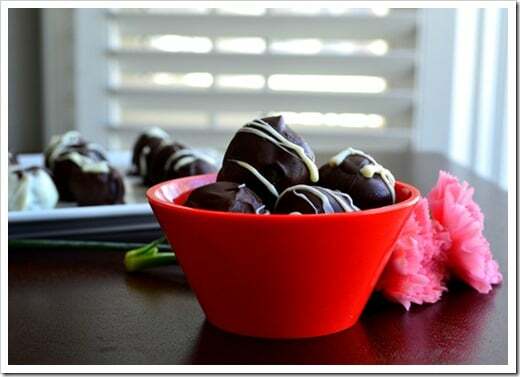 Remove the balls from the freezer and dip them in melted chocolate and coat them evenly. 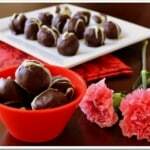 I used my fingers or you can use lollipop sticks to dip the balls in chocolate. Let excess chocolate drip to the bowl before placing them on a wax sheet. Repeat the process for the next 39 truffles. beautiful preparation and presentation…..looks awesome!